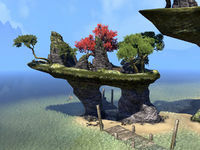 Smuggler's Cove is a small dock in central Auridon, on the coast west of the town of Shattered Grove. It was the drop off point for a group of smugglers, though it has recently been infested by imps, as well as a surly crocodile. It is also the location of the buried treasure described by a treasure map.